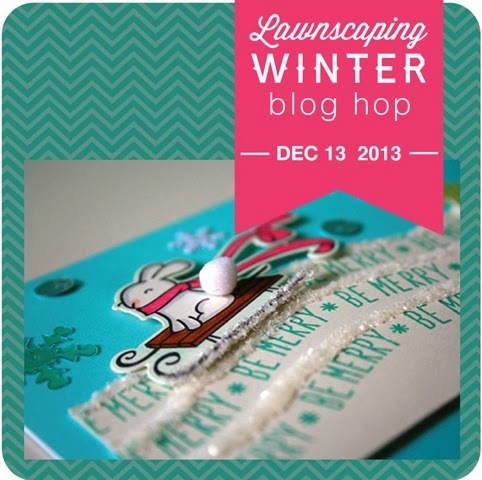 Ready for some (more) Winter Fun with the Lawnscaping Winter Blog Hop? ... there are prizes for the hoppers !! Yay! So I would encourage you to comment on each of the Blog Hop posts as there will be lots of prizes!! Please check out the fabulous sponsors and the details about the prizes on the Lawnscaping blog. 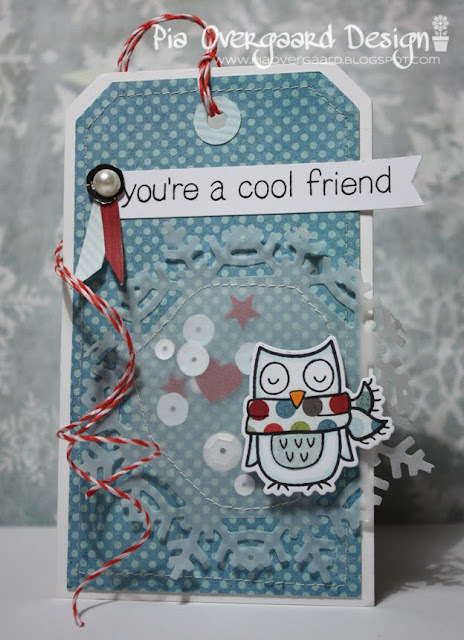 I am sharing a fun winter tag using one my favorite owl stamps from Lawn Fawn - I just love this little guy and I made him winter frosty. Other: Lawn Fawn Twine, Sequins, MFT snowflake die. A lot going on on this tag, huh!? So the next one here is a very simple and clean winter card with another winter favorite - namely the bunny. I adore that stamp with the fun scarf and I absolutely love the coordinating die, which also makes it possible to make some extra dimension to a clean card, like the one here on the card. Other: Copics, Wink of Stelle glitter pen. Now I want to thank you so much for hopping by today! Don't forget to comment for a chance to win. Sunday, 12/15 at 11:59PM EST. I will now send you off to the next one on the hop. The very talented Christiana Reuling and her wonderful blog. adorable...love what you've done with the vellum and sequins...EXcellent work. Your be merry card? LOVE. Your tag is darling!! Love the snowflake and colors on it! :) Love your CAS design with the bunny coming from the edge as well! Thanks for sharing! Cute bunny sledding! Love the vellum snowflake! Cuteness all around! Pretty tag and I love the way you die cut the top of the card to show the bunny underneath. your tag is so sweet! i love all the little details you added :) and super cute CAS card as well :) happy to have you on the hop!! i just want to snuggle up with that owl and his polka dotted scarf!!! I love all the texture you created with the vellum. Amazing work on the tag, it's wonderful! This is excellent!! Especially love the tag... great job! Oh I love that you made the tag a "shaker". Fabulous work. Your snowflake shaker with the paper pieced owl is ADORABLE!!! Great cards, I especially love the snowflake stitched card! Your snowflake shaker tag is so awesome! It's one way to have snow ;) loving the paper piecing on that owl.. Your card blew me away!!!! Seriously awesome! I lobe how you added the extra interest with using the die. So creative. Your shaker tag is fantastic, love the soft touch wth the vellum and the card is so creatively crafted, love it! These plugs are really too beautiful! I love the bunny card. It's so sweet and simple. SO cute! Love the stitched pocket!! Was a pleasure creating alongside of you today! Two fabulous cards! I love the little stitched sequins area on the first one! Greta cards. I love how simple your 2nd card is. Very pretty projects! I love the colors you used! Like the use of the vellum & stitching. Both cards are great. Love the owl's scarf! Oh, the shaker snowflake is just so creative! Fab cards. Like the dimention of the (second) card! Pia! This is fantastic! Both the tag and card and amazing! Love these fun cards! They're both so awesome! Both gorgeous! 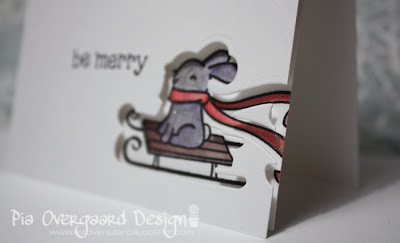 Love the vellum snowflake and what a cute bunny! Love these cards. That little owl is a favorite! Such a darling tag and card! These are both really cute cards and I really love the tag with the owl. Great idea with the shaker background. Fun tag and card. Love the bunny! I think your owl is so darling, as is your bunny. LOVE your sweet owl tag and the bunny is so sweet. Love the design. What a cool tag! And the bunny sledding car is adorable; I love all the white! So much goodness in that little tag-- I just love it! And great clean and simple card-- I really like the added dimension of the die cut panel on top of the stamping! I love your card and tag. The sequins behind the vellum snowflake is too CUTE!! Thanks for sharing. I love both your cards so much! Your diecut vellum snowflake is so pretty. Wonderful projects! Love the vellum snowflake and the die cutting to create the window! Wow! I LOVE the sequins behind that vellum. I've wanted to learn forever how to sew on cards. I just adore the look of that on your card. TFS! what a cool tag!!!! LOOOOOVE the vellum snowflake with sequins in it!!! how cool is that?!?! and the card is totally cool!! i think that white from the die and the white from the card base is so cool! and the extra sparkle on the bunny is perfect! Love everything against the beautiful vellum snowflake. Fabulous. Love that sweet little owl and that bunny is just adorable. I really am liking your polka dot scarf! He is just so cute with that. I also especially love your sequin pocket. Both are so cute. I don't think I'm brave enough to sew on vellum, but I love the look on your tag! So cute, love them both. What beautiful tag and card. Thanks for sharing. Excellent card making! love the Merry card! Your tag is adorable! Great little details - so fun! Very cute! I love the tag!!! Both your projects are super adorable!!! Vellum, stitching and sequins? Love love love it! Sweet cards!!! I love the owl's polka dot scarf and the sequin shaker and then the rabbit on the sled is so adorable! Love the vellum snowflake and the diecut bunny is so creative! Such a gorgeous tag. I love the owl's scarf. And the winter bunny card is so clever. I love the shadowing on the bunny. So cool! I love your cards! That owl set has to be one of my Favs! Thanks for the inspiration! Your tag if FANTASTIC! I love all the elements in it. Wow! What a fabulous tag! Love the shaker snowflake, so cool! Love how you stitched the vellum snowflake to make the shaker element on the tag. The card is so clever to die cut the front panel. Love your tag. The background polka dot paper is really pretty and the sequins give it some bling. My favorite thing is the paper pieced polka dot scarf. So cute! The bunny is darling too. Oh I so love that cute owl! Nice! Love the vellum snowflake and your owl! love the cards--the snowflake is inspired! Those are both such fun! That vellum shaker is wonderful. And you used my favorite - Winter Bunny - too. Thanks for sharing! 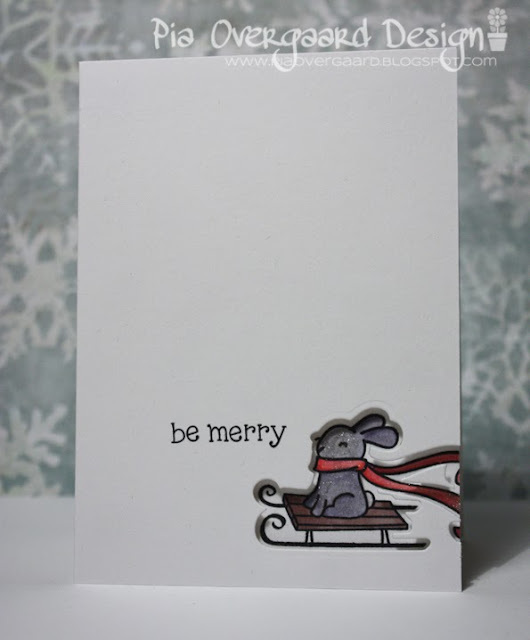 Cool tag with the vellum snowflake shaker and cute bunny card. Love the use of vellum in the tag! I love the owl card! Clever use of the snowflake! Love the owl tag, especially the shaker! Really fabulous cards, love the shaker. Love the incorporated shaker element on your tag! So adorabel Cards you have made. But now i always love your Cards - and miss your store sooo much! Love the vellum snowflake, and how ingenious to make it into a shaker! This is so very sweet and I love your design elements! awww love the owl and his little sequin pocket! that is really really cute! Really cute, both the tag and the card! I love what you did with the vellum snowflake! Both your tag and card are very cute! The snowflake looks awesome on this! Fun and absolute adorable. TFS your creations Pia!! LOVE your gorgeous vellum snowflake, and LOVE your negative die cut - perfect!!! Both projects are very cute! I love the shaker snowflake idea, brilliant! that is the sweetest tag i have ever seen. love your vellum. Aw, love the owl! I'm always amazed by CAS cards as I cannot do them well! Great projects! love that vellum snowflake Pia, just super! That tag is so cute, has lots of details like the stitching, the sequins, the colorful scarf. Love how you die cut on your card! So clever! Your winter owl tag is AMAZING!!! It looks so perfect! Your bunny card is also neat and great! Thank you for sharing these beauties!